BROOKLINE, Mass. - For a team that depends heavily on four sophomores, Brookline has the makings of a group primed to make some noise. Lead by double digit scoring from Mark Barrett (15 points), Wesley Delvar (11 points), and Chris Camille (10 points), the Warriors improved to 3-0 on the season, as they overcame a 32-point, 10 rebound performance from Braintree’s Nick Timberlake to defeat the Wamps, 60-57, on Tuesday night at Brookline High School. The 3-0 start is quite the turnaround for Brookline, considering the Warriors missed the state tournament altogether last season. Brookline head coach Lucas Day said the game displayed the Warriors' ability to win games in a variety of ways. Through their first two games, Brookline has proved itself to be a team built upon a fast-paced, high-octane offense. On Tuesday night, though, they were forced to be productive in another fashion, as Briantree’s hard-nosed, physical style of play turned the game into a half-court blood bath. As the game ticked to less than three minutes, it appeared as though Brookline was going to beat Braintree (2-1) at its own game in style, leading 57-48. Timberlake and Braintree had other ideas. The Wamps’ senior guard knocked down a pair of free throws to trim the deficit to seven, 57-50. Moments later, Timberlake forced a turnover and dished a cross court pass over to Aidan Conboy, who drilled a catch and shoot three pointer to bring Briantree within four. Finally, Timerlake capped off the Wamps’ 7-0 run by picking off a pass and slamming it home to cut the Brookline lead to just 57-55. Barrett was fouled on the ensuing inbounds pass and knocked down one of two of the line before Timberlake hit two free throws of his own to make it a one-point game. 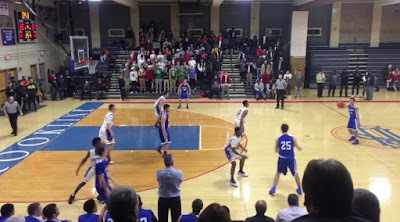 Braintree, however, was unable to get over the hill as two free throws from Dulvar put Brookline back up three, 60-57, and the Wamps last second three pointer from the top of the key hit the back of the rim, sealing the victory for the Warriors. Barrett believes a game like Tuesday’s will give his team a boost moving forward. Early on it appeared as though Brookline was going to be able to dictate the pace. The Warriors used their run-and-gun style to produce four combined three pointers out of Camille, Barrett, and Henry Terry, and shot 70 percent overall from the field as they built a 19-11 first quarter advantage. As the game went on, however, the Wamps began to assert their defensive will. A combination of man-to-man and a 2-3 zone kept the Warriors offense off balance, while on the other end of the floor Timberlake was trying to take over the game. Timberlake opened the scoring by hitting two straight three pointers from the wing and late in the opening quarter drilled another one from behind the arc to bring Braintree within 19-16 after one. Midway through the third quarter the game seemed to be slipping away from Braintree. Three straight layups from Delvar, Henry Cher, and Camille had given the Warriors a 13-point edge at 44-31 but, as he did all evening long, Timberlake brought Briantree back. Two free throws and a two handed dunk by Timberlake circled around an Alex Kennedy jump shot brought Braintree to within seven heading into the final frame. Braintree, though, was never able to grab full control of the game. All evening long the Wamps were hampered by poor free throw shooting (13-for-28) and turnovers (19). Over the last couple of seasons, however, Braintree has proven that their style of play is more than effective. They used it to upset 17-3 BC High in the first round of the state tournament back in 2013, and nearly upset Catholic Memorial last season in the south sectional quarterfinals. So, while the attention has rightly been focused on Newton North and Needham as the teams to beat in the Bay State Conference, there is no question that Brookline and Braintree have both established themselves as legitimate threats in Division 1 South.